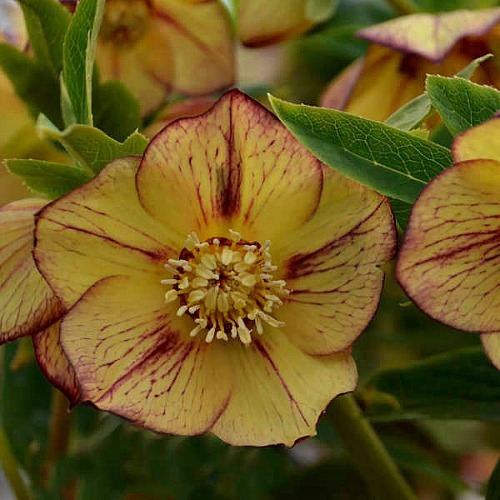 If you are looking for Hellebores that is going to be fun to plant, then this tropical sunset drink is just perfect. It has 3” creamy yellow flowers that feature burgundy red veins and picotee, making them a beautiful sight in any garden. This shade loving evergreen plant blooms for six weeks, beginning in late winter, and often flowers during lent season, and thus its common name, Lenten rose. If you are looking for Hellebores that is going to be fun to plant, then this tropical sunset drink is just perfect. It has 3” creamy yellow flowers that feature burgundy red veins and picotee, making them a beautiful sight in any garden. This shade loving evergreen plant blooms for six weeks, beginning in late winter, and often flowers during lent season, and thus its common name, Lenten rose. It has an extensive root system, and is therefore perfect for moist woodland areas. The romantic getaway hellebore is an evergreen, slow growing plant that grows to a height of 18-24 inches with equal spread. Its beautiful flowers attract bees throughout bloom, but is deer and rabbit resistant. It is perfect for eclectic or woodland style gardens, or can be grown as a container plant too. It is ideal for mass planting, and looks wonderful when mixed with Brunnera emerald mist, Haucherella catching fire, Pulmonaria pretty in pink, and Tiarella cutting edge. Anna’s red hellebore is a very easy to maintain plant, and also very disease and pest resistant. They do well in moist organic soils, but will also do fairly well in clay and sandy soils. They are also fairly tolerant, and will tolerate short drought periods. They however, should be grown in the shade under deciduous trees. This is so that they get full sun in the winter and spring seasons before the trees get their foliage back. If you want to trim, it is recommended that you trim the previous year’s foliage in the spring. The Helleborous tropical sunset is a very poisonous plant, and no part of it should be eaten. After planting the Tropical Sunset Hellebores this winter, click below and make a 'visit' to the St. James Club in Antigua below and make your own Tropical Sunset Drink with this recipe. Helleborus Tropical Sunset is grown in a one gallon container.